Thor is actually a twin to sister Freya! Freya did very well after they arrived a little early at 35 weeks gestation. 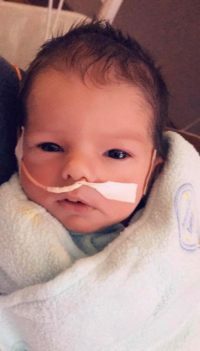 Thor was admitted to the NICU because he was having issues breathing and then had to overcome pneumonia during his admission. Mom and dad had their hands full with one twin in the NICU, a newborn at home, 2 older siblings, work, and a long commute to Des Moines to visit Thor. Now he is happy at home with his family!